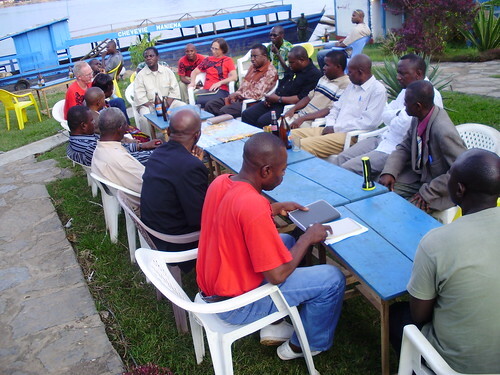 On 11 April 2009, the day before Easter, there was a meeting of chiefs in Kindu. 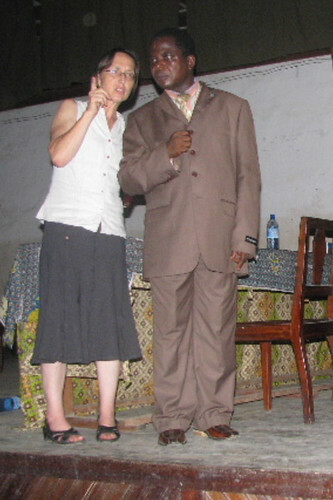 The chief of the Bangengele (woman on left) and the chief of the Balanga are present. How will we know if it is reversed? Simple: By the continuing flow of bonobo carcasses to market; by the continuing bicycle loads of dried red colobus, until there are no more; by the failure to observe the no- hunting season. John tells it as he saw it: the scale of hunting, the impact of hunting. This is a meeting “we” planned, but who is “we”? Not just John, me and the TL2 team leaders, this includes the very competent, Stanislas, director of cabinet for Maniema’s Environment Minister. Dir.Cab. is what everyone calls him; Dear Cob is what John writes one evening after sharing a slow bottle of wine with Stanislas at our Kindu base. Sharing notes with the Dir.Cab. at lunch break on the 11 April 09. 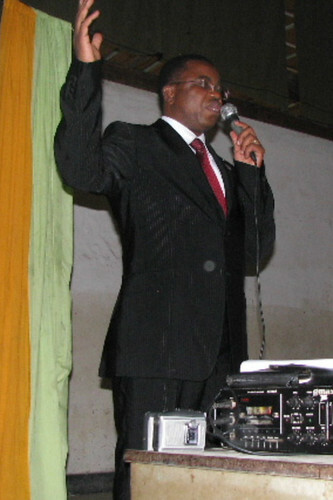 “We” includes the Reverend Cosma Wilungula, head of Congolese Parks, who opened the meeting with a prayer, gave a moving speech, and closed the meeting with another prayer. “We” means the governor, the vice-governor, and the environmental minister. 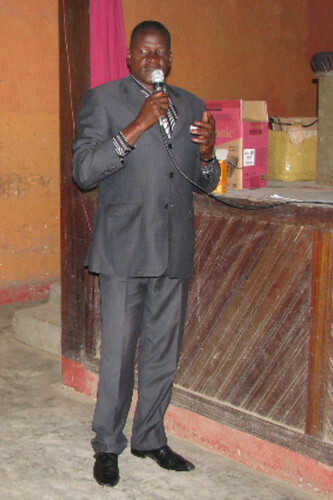 “We” means Salumu, the TL2 Maniema base manager, who welcomed participants as they arrived by bicycle and dugout. The head of National Parks addressing the gathering. 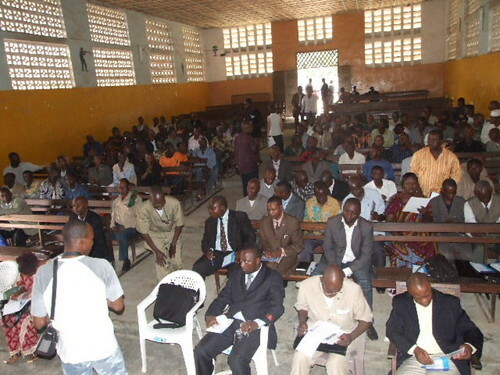 This meeting is a success if the “we” who are supporters of a bonobo forest along the Lomami becomes a bigger and bigger “we” as the word moves back through the villages and chiefdoms. 2. 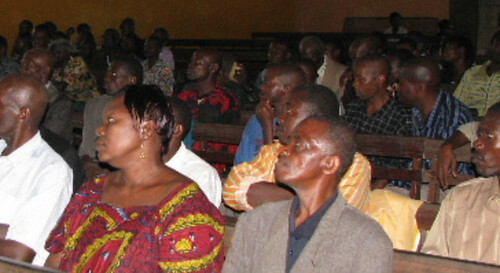 No hunting in all of Maniema province during six months that will start in June 2009 and will be repeated each year. 3. 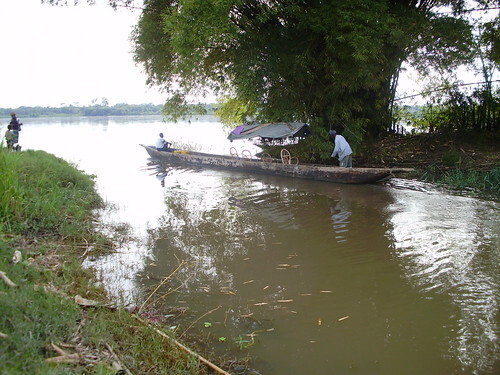 No hunting ever, in a part of forest along the Lomami River that will become a protected area. This meeting’s first indication of success came as one chief after another stood up and said “I do”,each in their local language, “I do support a protected area”. The chief from Ambwe says “I do agree”. Most chiefs came by dugout or by bicycle. This dugout is at Lokando on the Lualaba River. Then the chief from Ambwe closed his forest to all hunting for a year. And I have just heard that the same happened in a collective of the Bangengele. A meeting with some of the top chiefs and authorities after the general gathering. And what we know is that now is a critical time to stay engaged, to monitor to encourage…. 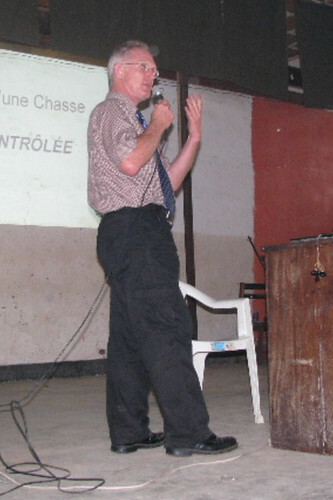 This entry was written by Terese Hart, posted on 2009-05-04 at 1:02 pm, filed under About the project, Bushmeat. Bookmark the permalink. Follow any comments here with the RSS feed for this post. Post a comment or leave a trackback: Trackback URL. Mama and Baba, Congratulations! To you and the team! This is truly hopeful and wonderful news. I hope that chiefs are able to keep their word, and that the general mindset towards the environment can change. The general mindset is all important. A collective responsibility is needed for what is a collectively beneficial resource, but a resource that can be demolished by a few. That fact is actually easily understood and was understood by some before we ever showed up. What was needed was a point, or reason for people to come together and to stand up to what are some powerful individuals who don’t want to lose their profits. Congratulations and I dearly hope for measurable and lasting results! Thank you for sharing all the details. It is a great post to read at the end of a long work day. Congratulations to you and John and the TL2 team, you have come so far and with the momentum started there is so much reason for hope for this critical forest area. We are hopeful, Kate. Sometimes very hopeful, there is no effective institution of law and order that can rise to the occasion…not the police, not the army, not the ministry. Good will there is…. but I am not sure that there is an effective way to materialize it. This is not generally a law-and-order country….even when many want it. But we are hopeful….just got to keep the momentum!! John and Terese: I can only imagine the months of painstaking groundwork that went into this meeting. Congratulations–not just on the consensus building, but on keeping us informed through this terrific web site. You may be hearing soon from one of my colleagues based in Jo’burg. His name is Barry Bearak, he’s interested in this story, and is a superb journo. I took the liberty of giving him your contacts.